Jump to the Map and altitude profile. The Riviera del Levante is the coastline to the east of Genova. 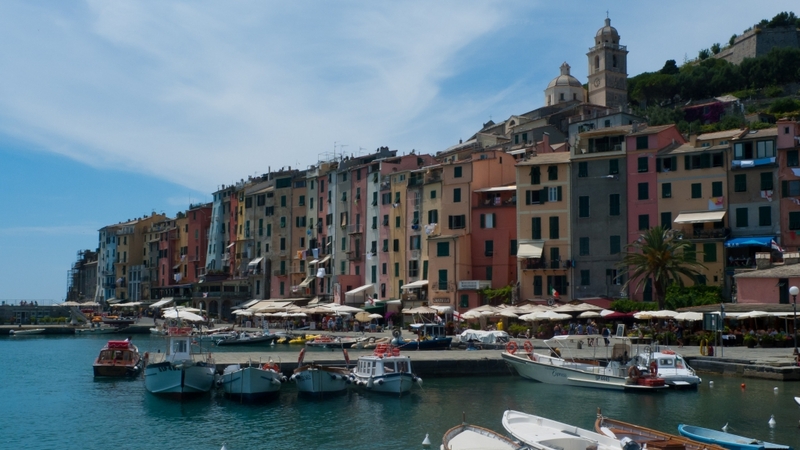 It certainly has its share of the glamorous names: the World-Heritage-listed Cinque Terre and Portovenere, as well as Portofino and Rapallo. Next door to the Cinque Terre is the Golfo della Spezia also known as the Golfo dei Poeti - the area was home at different times to Byron, Shelley, DH Lawrence and George Sand. Shelley drowned in a shipwreck as his boat returned to the village of San Terenzo near Lerici. The artist JMW Turner also visited the area three times painting and sketching extens­ively. 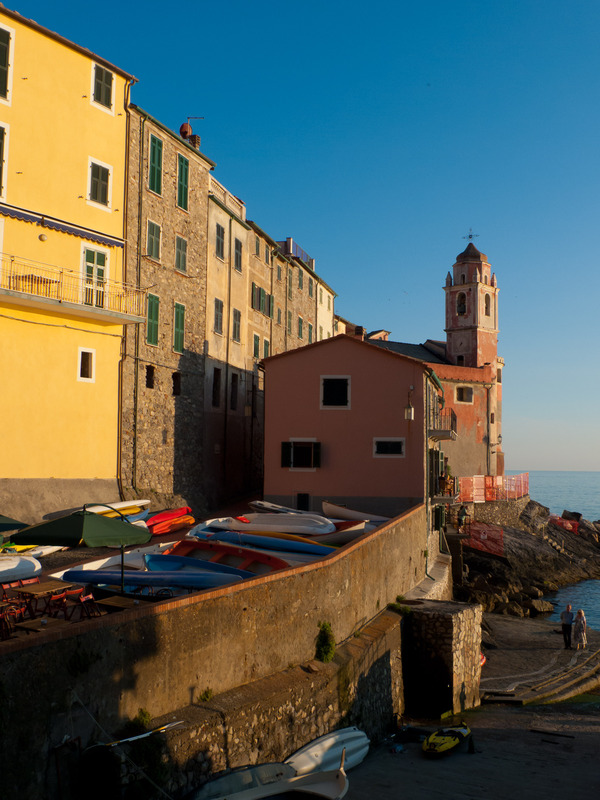 The big-name glamour comes at a price though: in summer the tiny villages of the Cinque Terre are swamped with day-trippers, and this part of the coast seems to be an oblig­atory stop for huge Mediterranean cruise ships. The roads are also busy. This section of the coast is different from the Riviera Ponente in that it involves a lot more climbing - especially around the Cinque Terre. There's a climb of a little over 600 metres in altitude from Sestri Levante to the Passo del Bracco and a climb of a little over 500 metres from Levanto on the way to La Spezia. From the centre of Genova the tour follows the shore out towards Nervi. The main expressway through town takes the through traffic and the coast road is relat­ively quieter, and a lot more scenic. (Note: if you are coming from the south make sure not to miss the turning at Nervi - don't get onto the elevated road by mistake). From Nervi the Via Aurelia (SS1/​SP1) takes you on through Bogliasco and Sori. 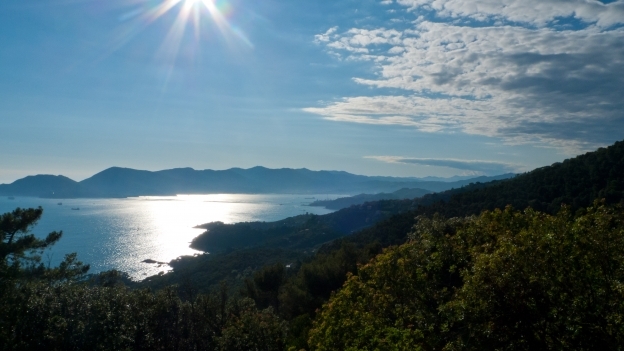 It skirts the borders of the Portofino parco naturale before you turn off and descend towards Santa Margherita. A nice descent with views out to sea and some attractive villas. Santa Margherita is a stylish, fashionable resort with a number of grand hotels built in the Liberty (Art Nouveau) style. South from the town there's a truly gorgeous stretch of coast road towards the resort of Portofino. Portofino has the reputation for being very upmarket and exclusive with huge yachts parked in the bay, although when I was there most visitors seemed to be from a cruise ship moored offshore. Note that bikes - even if you are pushing them - are banned from the centre of the village around the quayside. 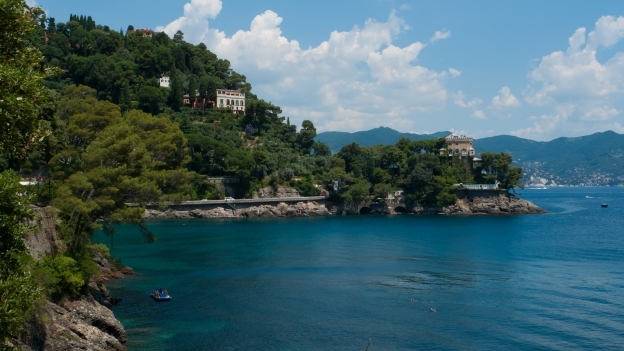 From Santa Margherita, the coast road continues on via San Michele di Paganina to the resort Rapallo. This section of the route follows a minor road, but in summer with the traffic heading into and out of Santa Margherita Ligure it was busy and narrow. At Zoagli look out for the Liberty-style palazzo on your right (as you head towards Chiavari) - on the cusp between Art Nouveau and Art Deco and looks like it wouldn't have been out of place as the setting for the filming of Citizen Kane picture (opens in overlay). Between Chiavari and Sestri Levante the rail line runs between the main road and the sea so there is little to see - a better option is to take the minor road that runs parallel with it but slightly higher up - a gorgeous ride through olive groves along a quiet road: it's difficult to believe that the hubbub of the coast is only a couple of hundred metres away. From Sestri Levante the route climbs up to the Passo di Bracco (610 metres). I took the Via Aurelia out of town, but the Ciclovia Francigena (until recently called the Ciclovia dei Pellegrini) offers an altern­ative option. This stretch of the Via Aurelia couldn't have been more different to those elsewhere along the coast: it was hard to believe how quiet it was - despite the fact that it is so close to the tourist magnet of the Cinque Terre. You could well see almost as many cyclists as cars. After the climb to the Passo di Bracco, the destin­ation is Levanto. The main gateway to the Cinque Terre. 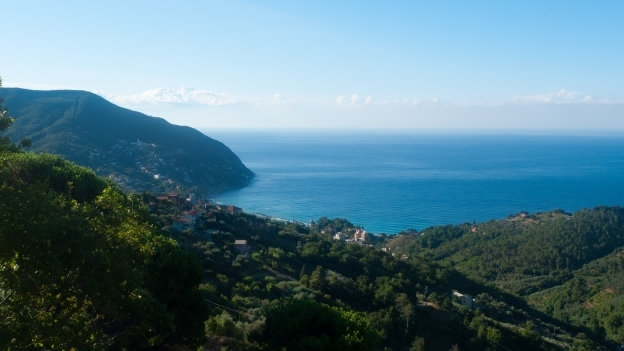 There's a 4-kilometre cycleway along the coast between Framura and Levanto. The cycleway has restored and preserved a section of the rail line. It was and is an impressive achievement that you can't but admire, and be grateful that it has been preserved so we can see it. That said, this section is mainly in tunnels and, apart from a couple of places where there are viewing platforms offering dramatic views over the sea, there's not really a lot to see apart from admiring the achievement of the engineers and stone­masons. 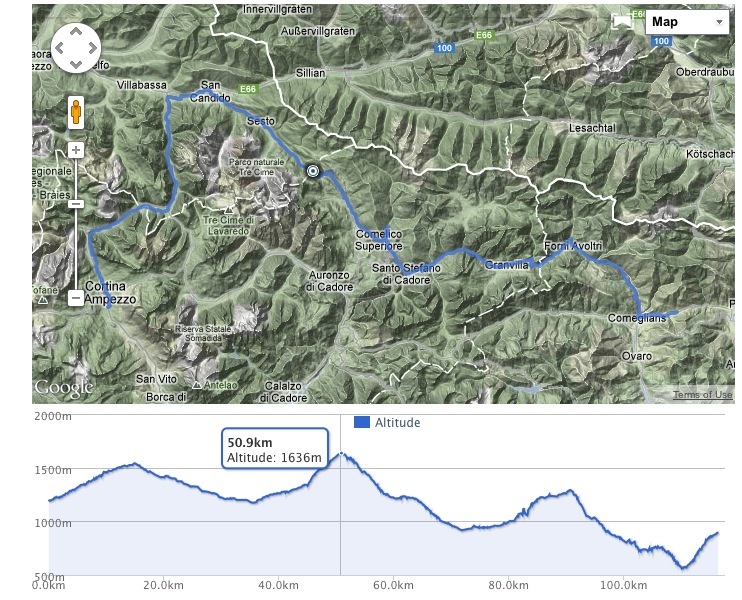 It's also not partic­u­larly ideal as a through route - my advice would be to either take the scenic road down into Levanto and then cycle the cycleway as a loop, or descend to Bonassola and pick up the cycleway there. 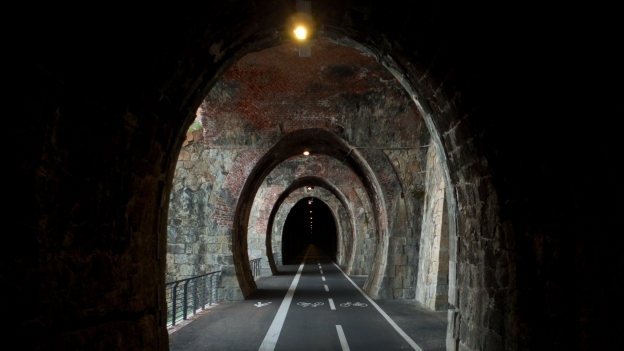 This stretch of tunnel also has historical signi­ficance for other reasons: during the second world war 15 American commandos landed here with the aim of blowing up the tunnel, but the mission went wrong and they landed a couple of miles down the coast, and were subsequently captured and executed at Punta Bianca near Ameglia (further south on the route). There's a memorial at Punta Bianca and in the Piazza della Libertà in Ameglia You can read the story on Wikipedia - and don't overlook the story of Alexander zu Dohna-Schlobitten the German officer who refused to sign the order for the execution. They are, under­standably, a major tourist attraction. But unfor­tu­nately the combin­ation of large numbers of visitors and very small villages isn't a good one: while larger towns, like Pisa say, can absorb a huge influx of visitors, the little places tend to get swamped. Portovenere seemed to me to be the exception to this - it was my favourite of the places I visited - perhaps because it is slightly larger, or perhaps because visitors are so intent on getting to the Cinque Terre that they give Portovenere a miss, leaving the seafront to the local teenagers relaxing after school. The road through the Cinque Terre involves a signi­ficant amount of climbing (and even more if you opt to go down to one of the villages). My suggestion would be to arrange to stay overnight at one of the villages: that way the amount of climbing becomes a little less intim­id­ating, and you can enjoy the village in relative peace and quiet after the crowds have gone (hopefully). Note though that in high summer there's also a lot of demand for accom­mod­ation - booking in advance is probably a good idea. 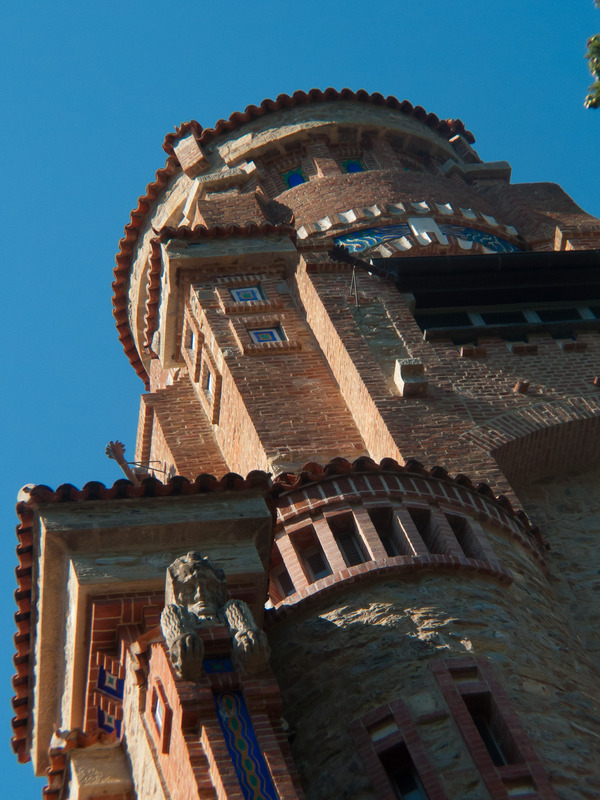 Alternatively, if you need a bailout option, you could decide, if you've had enough, to descend to the next village and take a train to La Spezia. The other altern­ative would be to spend the day visiting the area by boat or by train and then take the road via Pignone and the Pian di Barca and La Spezia. It's a quiet route along scenic roads. You could also stick with the Via Aurelia almost all the way to La Spezia. For most of the way the road is very quiet and scenic. Be careful to avoid the tunnel down into La Spezia - there are two, more scenic and less stressful, options. In 2011 the Cinque Terre were hit by floods and landslides which swept away the railway line at Vernazze and left the main street filled with mud and debris to the first floor windows. The people of the area showed incredible resilience in coming back from the disaster, and visiting today you'll see very little evidence of the devast­ation, but as you approach towards the new rail bridge at Vernazza look for the poster on the right-hand side with photo­graphs of local people clearing up the mess. At the time a local resident put together this video showing the devast­ation. There's no soundtrack - the pictures tell the story. If you are heading south from La Spezia resist the temptation to cut the corner and omit the coast on the other side of the bay: the road via Lerici, Montemarcello and Ameglia is quite possibly the best bit of cycling along the whole of this part of the coast - a lovely road and great views passing through some attractive and relat­ively unspoilt villages. It's quite defin­itely one of the highlights. If you have the time make the detour on the narrow road to the village of Tellaro. This has all of the atmosphere of the Cinque Terre with houses clinging to the shoreline around the little church - without the crowds. There's a campsite (the Campeggio Gianna). As you near La Spezia, you catch sight of the Alpi Apuane - the dramatic set of mountains that dominate the coastline of northern Toscana. If you thought that after crossing the Alps you had left the mountain behind the first sight of the Alpi Apuane may coming as a shock. If you are heading south you have the choice taking the Tuscan Coast tour which continues to Viareggio and along the coast of Toscana. 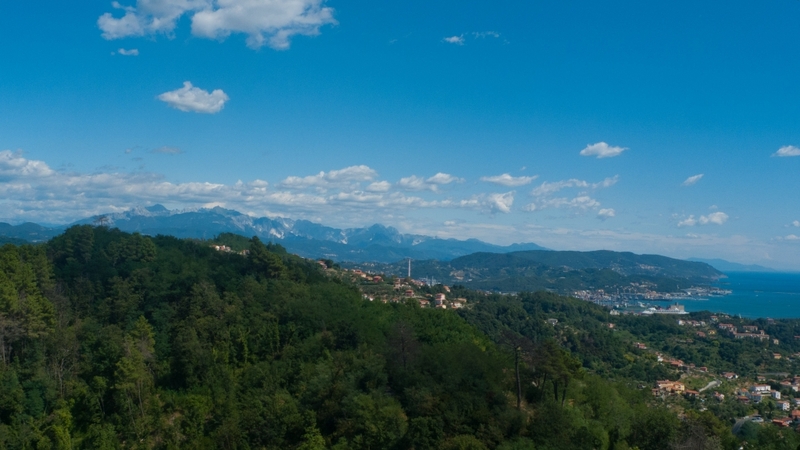 Alternatively you could head inland and skirt around the northern side of the mountains taking the road to Lucca through the Lunigiana and Garfagnana. The route joins with one of the variants of the eurovelo 5 (Ciclovia Francigena (until recently called the Ciclovia dei Pellegrini)). The EV5 takes the coast road to Viareggio and from there it heads for Pisa and through Toscana to Siena and on from there towards Rome. 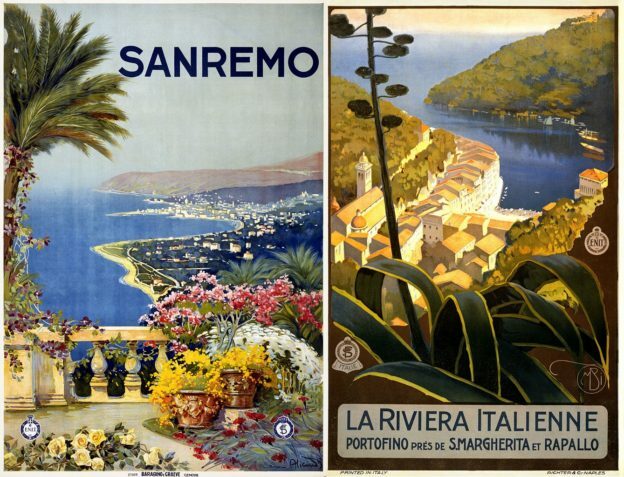 There are lots of campsites along the riviera - although quality and prices are variable. Sites along the coast itself can often be expensive and crowded - inland sites, although few and far between, may offer a better deal. Senato Park. Attractive site with large area for tents with lots of trees, but let down by antiquated services. Update: the site's website has disap­peared, however there are a couple of altern­atives nearby. Most points along the route are close to a train station with services to Pisa. From Pisa you can easily get to Firenze, or go south to Rome. Pisa airport is about a day's ride from the end of the tour. Livorno offers ferry connec­tions to Corsica, Sardegna, Barcelona and Tangier.